Do you use a calendar to schedule out your days, weeks, and months? Duh. We all know that planning ahead is smart. Knowing what’s ahead keeps us on track and creates brain space to focus on what’s right in front of us. Content is no different. Just as we use a “life calendar” to track appointments, events, and the other million things going on in our businesses, it’s crucial to plan out your content strategy. 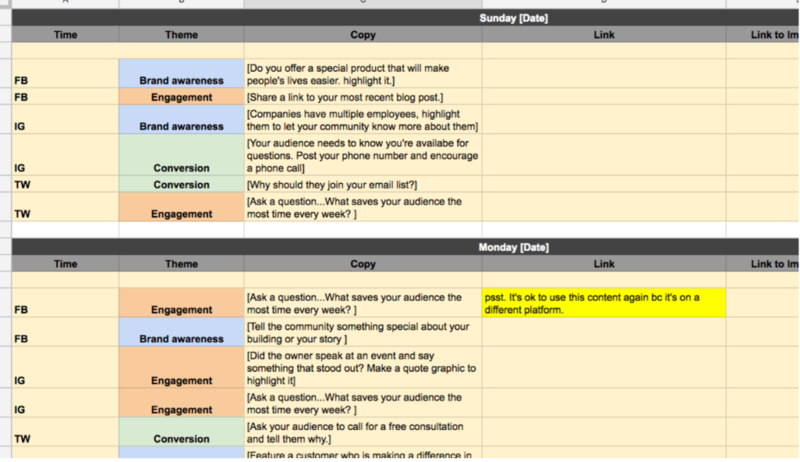 So why are so many folks NOT using a content calendar to plan ahead? It may seem daunting to some, or maybe you just don’t see the benefits. Our goal at Soulheart is to be intentional about everything we do, including planning out blogs (like this one) and social media posts. When you plan, you can be strategic about reaching your audience and speaking their language instead of posting a crappy picture of your last client meeting because you HAVE to post something that day. Today, we’re going to address which things you should plan out on your content calendar, why you track it, and we’ll end with some pro tips as you get started. What do you track on a content calendar? Outline your content themes, audience groups, and how often you will post on social media and your blog. This will influence your calendar from month-to-month. The second tab will outline your daily posting schedule. We’ve given you a week’s worth of generic ideas. 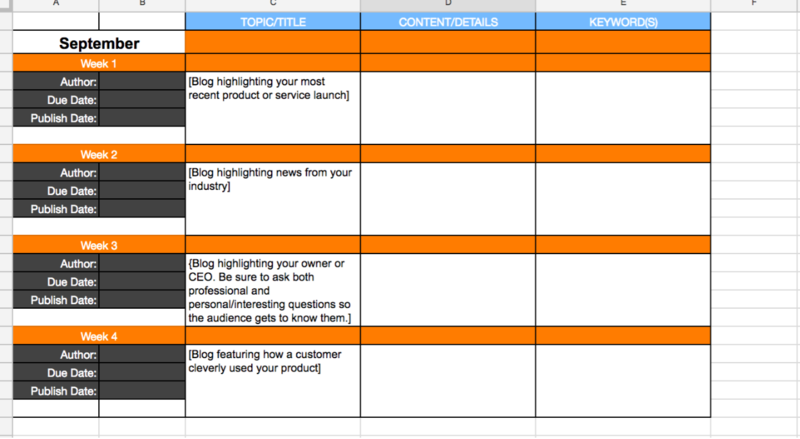 Once you nail down your specific content themes, this step will be a breeze! This is where you’ll put your content themes in your calendar along with your captions and links to your website or images. Every business will be different, and as you continue to use the calendar, it will get easier to fill this out every month. The beauty is that if you can sit down and dedicate a couple of hours to write an entire month of content, it will save you time over the course of the whole month! An image. Because you’re planning ahead, you’ll be able to have custom graphics created for you to complement your captions. An “approval” column. This is especially helpful if you have someone on your team doing this. As the owner, you’ll be able to log in and approve or give feedback. Make sure you’re using a shared file system like Google Sheets if you want multiple people to be able to work in it. In our experience, the more you can plan ahead the better. But, it has to work for you and your business. If it works for you to only plan the caption and image, do that for now. But work up to more as you get in the groove of planning ahead. The following tabs will be your blog content scheduled out. We encourage you to utilize different writers in your company to fulfill the blog writing. Maybe the owner writes one every other month, the sales director writes one per month, and the marketing team covers the rest. Whatever it looks like, make sure you have multiple minds brainstorming and creating content. It will be more authentic and diverse coming from multiple people. TIP: Make sure you’re looking at analytics to see which blog posts do the best! Posting more content like this will most likely get you more fans and ultimately, customers. Why do you track it? Information is powerful! By creating a content calendar, you can be sure that you are representing ALL of the facets of your business. We don’t want anyone scrambling for content. When you use a calendar to organize your thoughts and clarify your strategy, you’ll never be in the “last minute content” position. Planning ahead allows you to plan for assets. We mean images or videos to really make your post pop. When you plan ahead, you give your designer (or yourself) enough time to create an image or video or set up a photoshoot to complement your ideas for captions. 1. Give yourself time to get good at using the content calendar. If you need to only post one time per platform per day to start out, then do that. 2. Check platform analytics at least once per month to see what kinds of posts are performing the best. Use that data to work more of that content into your calendar. 3. Create a workflow and set due dates for you and your team. A tool like Trello or Basecamp works really well for this. You can add and take away team members, set due dates, make comments, and hold each other accountable. 4. Keep your audiences in mind as you write captions. Each content theme (or topic) will speak to multiple audiences but make sure you have a specific one in mind for every post. Some businesses have to speak to teenagers, young moms and dads, college students, aging seniors, singles, and everyone in between. Make sure the content you are putting out there speaks to each audience group throughout the month. 5. Have routine brainstorm sessions with your team to consistently bring in fresh ideas, and keep track of all ideas to use in the future! You’ll always need a bank of ideas to pull from! In conclusion, a content calendar, although it does require some work, will keep you organized and save you time in the long run! 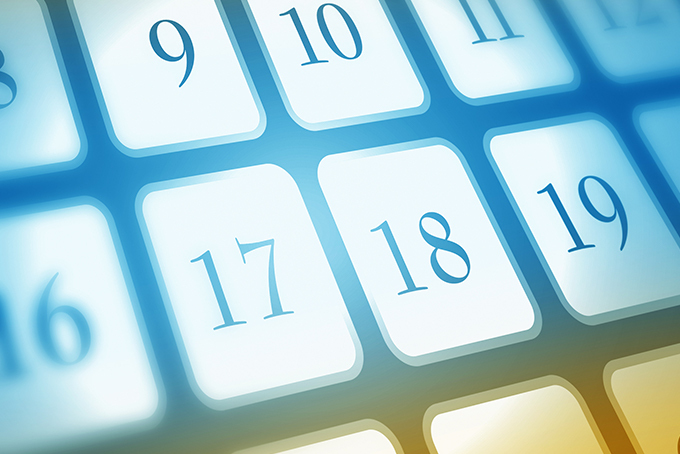 Download the FREE Content Calendar Now.